Today we are going to explore a unique and significant home, which makes use of clean lines and unusual shapes to create something incredible. 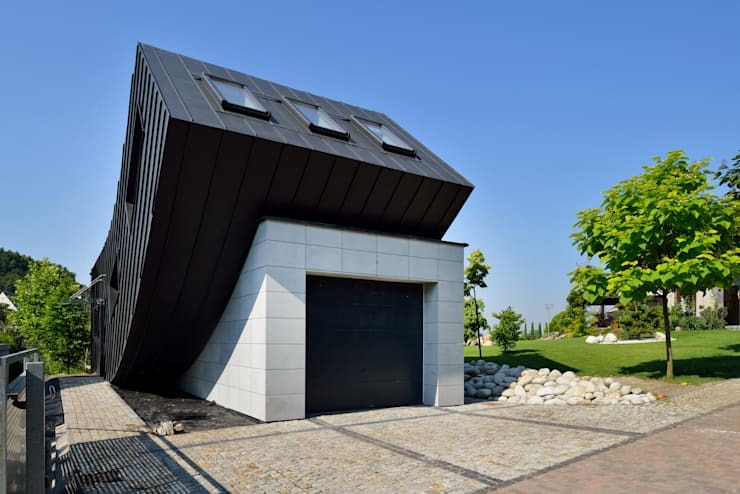 Designed by Polish architects, Architekt.Lemanski, this is a home that is neat, sophisticated, smart and savvy. We are going to see just how important geometry is and how much of a role it plays when it comes to cutting-edge architecture. As Marcus du Sautoy said, The power of mathematics is often to change one thing into another, to change geometry into language. Let's have a look at the incredible language that has been spoken in the form of this beautiful home. If we look at the home from this side, we can see how modern it truly is. A sophisticated charcoal black facade contrasts beautifully with the sandy coloured stones, bricks and wooden patio. Don't you love how the wooden patio is suspended above the ground? Very cute! We can see that the large glass windows and doors run along the entire length of the one side of the house, opening the home up onto the patio. This not only allows a lot of natural light to flow into the home, but it also creates a very transparent transition between the inside and the outside of home. There are little hints into the smart geometry of this home in this image, with the sharp lines between the manicured lawn and the stone bed. Can you believe how incredible this home is? There is a white tiled garage, which features a black garage door. 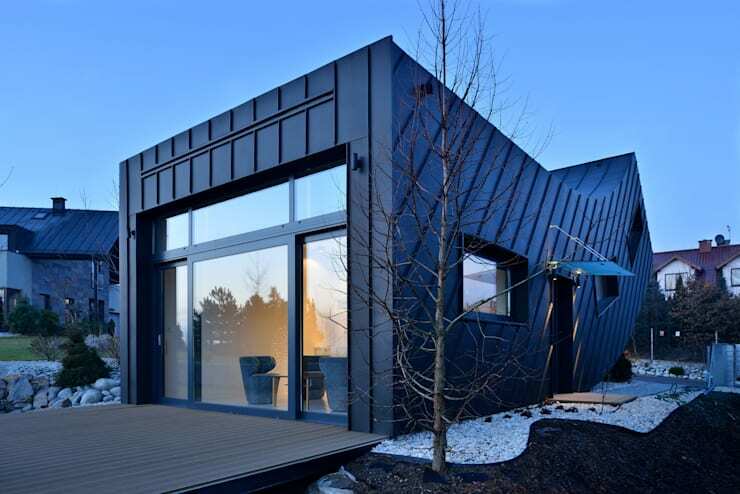 A second floor of the home, finished in the same black facade that we saw at the back of the home, sweeps up over the garage in a creative, geometric twist. This makes the home very unique! It almost looks like the second floor is leaning on the first floor. We can see that the upper level features three skylights, which again allow natural light to filter into the home—a great modern feature for any home! From this angle, we can see how the dark facade flows from the backyard to the front yard, flowing up at an angle. It almost looks like it's floating through the air! We can also see in this image how glass plays such an important role when it comes to the design. There are large glass windows and doors, which wonderfully enhance the entire exterior look and feel. This is functional too. Have a look at these: Eight great ways to furnish your home with glass. We can see that the designers have utilised every detail of the architecture, with a stone path that runs around the entire perimetre of the home. This path is lined with white stones, which are decorated with beautiful little plants and flowers. We love the windows that decorate this facade! If we have a sneak peek into this home, we can see how it takes on a minimalist look and feel, while still utilising geometry. 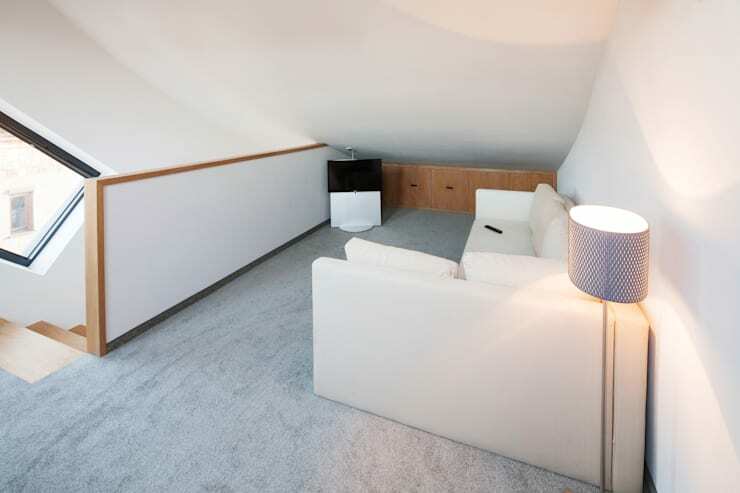 This is a little living room space, which has been positioned in the loft area of the home. The designers have gone for very neutral colours including white furniture, light grey flooring, white walls and light wooden finishes. You'll notice that they've only included functional furniture, which serves a purpose. This is a great tip for a home that is quite small! You'll also notice they've included a beautiful lamp in this space, which adds a soft, romantic light to the space. This is a great way to achieve some ambiance. The kitchen is just as neutral and sophisticated as the rest of the home—inside and out—but it features a splash of colour in the form of a retro red fridge. 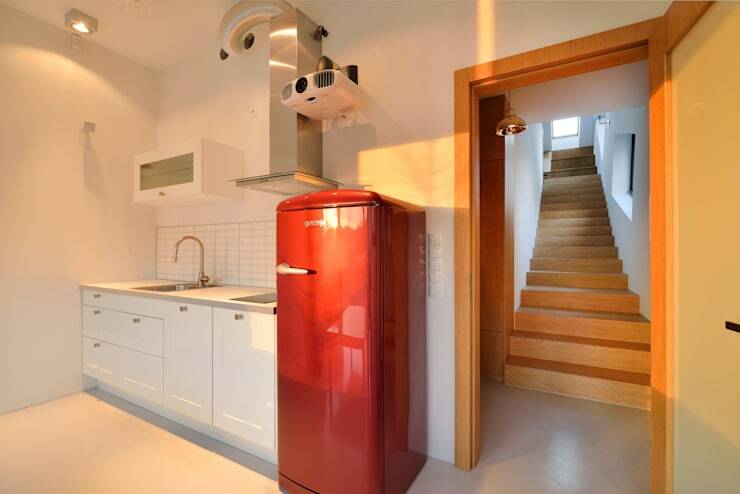 Don't you think this is really enhanced by the very clinical, white kitchen? White is a great colour for the kitchen as it creates a very clean look and feel. Add some colour for some warmth. Have a look at these: Seven ways to furnish a functional kitchen. Everything about this home screams class, style and sophisticated—all thanks to some careful geometry. 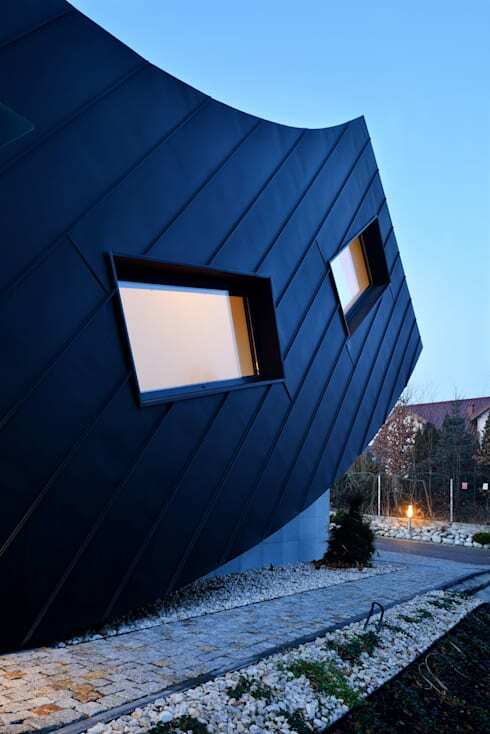 What do you think of this unusually designed home?